Berto and I looooove pizza. Not a very healthy statement but it is the absolute truth. It is our ultimate comfort food. Early on in our married life, we used to get the Pizza Hut Palm Card regularly. We'd get one then after 6 months it would expire and then we'd get another one immediately! That's how addicted we were to stuffed crust pizzas! Then one day, we decided this habit of ours is not really helping our weight-loss goals, not to mention our financial goals. So we stopped cold turkey. We gave away our Palm Card and just stopped ordering pizzas. Then a few years ago, we started ordering pizzas again. hehehe. But we resisted getting the palm card, so we wouldn't start thinking that we're wasting the card by not ordering more pizzas. We figured a pizza night every few weeks or so wouldn't hurt. We had such pizza night last night. I was feeling a bit down with my painful back and all (yeah, that's my lame excuse!) so I chided him into ordering pizzas so we can eat while we watch a movie on cable. So Berto immediately called the Pizza Hut hotline 911-1111 and ordered our favorite Bacon Cheeseburger Supreme. Then the lady on the other line started offering promos. Like the Buy 1 Take 1 Family Pizzas for only P409. It was tempting but customers are limited to only three flavors to choose from. So Berto just said we'd just get a regular order of pizza. 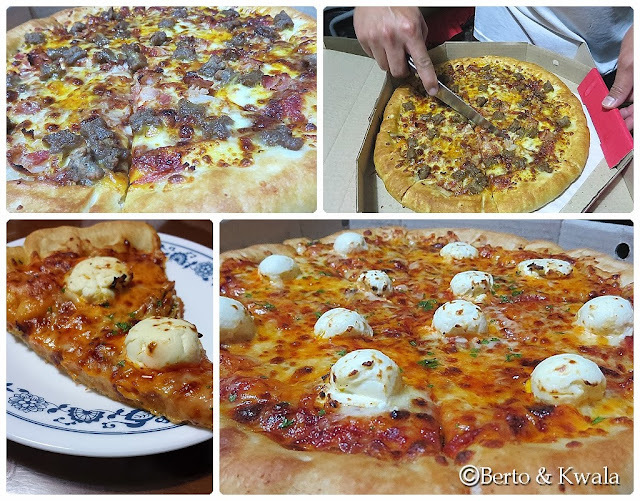 Then the lady again told us of another promo, where we can choose the flavors of 2 family size pizzas for P499. It was a great deal since a family pan pizza already costs P429! Another bonus is that they had an all-cheese flavor available, the cheesy 7 where the pan pizza is covered with 7 different kinds of cheeses! Wow! I was immediately sold! I just love cheese-flavored pizzas! We also asked for a stuffed crust upgrade for both pizzas! Yes, that's how much I love cheese! When the pizzas arrived less than 30 minutes later, our hearts were fluttering and our tummies were grumbling... giving our ulitmate comfort food the warm welcome they deserve! Woo hoo! PIZZA!! !